Minister Katherine Zappone at the announcement on 29 May. THE DEPARTMENT OF Children said that there were ethical implications around telling people decades later they’d been adopted, while Tusla warned that there were “far-reaching consequences” following on from its discovery in the St Patrick’s Guild adoption records. 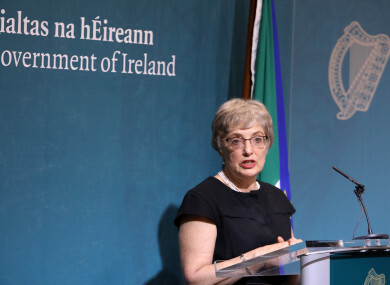 At a hastily arranged press conference on 29 May, Minister for Children Katherine Zappone revealed at least 126 children adopted from St Patrick’s Guild were incorrectly registered as the biological children of their adopted parents. It means that those people could have lived their whole lives without ever knowing they were adopted, as at least 79 had never had any contact with St Patrick’s Guild. People who were born between 1946 and 1969, who don’t have an adoption order, and were placed by St Patrick’s Guild may be affected by the revelation. Everyone affected would be contacted directly by Tusla when the Child and Family Agency has verified their identities, she said. Documents released to TheJournal.ie under the Freedom of Information Act have shown the correspondence between Tusla and the Department of Children prior to this being made public. In the correspondence, it is clear that Tusla wanted to get as much information as possible about the problem before going public but conversations were had about the ethicality of telling people at this stage of their lives that they’d been adopted. In one letter, the most senior civil servant in the department expresses the concern that disclosing the information to people “may do more harm than good”. Tusla was given over 13,000 records from St Patrick’s Guild Adoption Society on 25 May 2016. When it discovered that children were incorrectly registered, it notified the Commission of Investigation into Mother and Baby Homes in July 2017. Only 25 cases had been noted at this stage. Tusla then began to dig deeper into the matter and sought legal advice in November 2017, before commencing its full scan of the records in January 2018. In particular, records that said “adoption from birth” were identified as potentially being an incorrect registration. Tusla notified the Department of Children and Youth Affairs in 15 February this year, the documents released to TheJournal.ie show. In the course of [its] work, the Agency has identified a number of records where it believes there is documentary evidence of the practice of incorrect registration, often known as illegal registrations or adoption from birth. Mugan said that this discovery has “far-reaching consequences for all stakeholders”. She said that it could affect birth parents who may have understood their child was legally adopted, or who’d been advised or believe that the pregnancy and birth were confidential and would never be spoken of again. The child who was adopted, meanwhile, “may be completely unaware of the circumstances of their birth and placement,” Mugan said. She added that Tusla had immediately drafted a plan to deal with the problem, including auditing all the records in its possession, reporting the matter to An Garda Síochána and create a dedicated team to help those effected. At this stage in February 2018, Tusla didn’t know how many incorrect registrations may exist in the records and wasn’t in a position to give an estimate. At a meeting on 20 February – with attendees including Tusla CEO Fred McBride and department secretary general Fergal Lynch – Tusla said that it had reported the matter to the gardaí, who had asked for a sample of evidence and said that they may refer the matter to the DPP. In a letter sent the very next day, Lynch wrote to McBride requesting a clear timeline and action plan for how Tusla would deal with the situation, and said that matters must be dealt with in a “careful, sensitive and transparent manner”. Correspondence continued between Tusla and the department into the next month. On 15 March, the agency’s director of transformation and policy Cormac Quinlan wrote to Lynch with a progress report. On 23 March, Tusla provided its first progress report to the Department of Children. At this stage, it had only confirmed an incorrect birth registration in 104 cases. In March, due to the “sensitivity and importance of the matter”, an early warning notification was issued to the government through the Department of An Taoiseach. The following month, at another meeting between Tusla and department officials, it was confirmed that the agency had referred 10 sample cases to the gardaí, so it could begin its own investigation to establish if any criminality occurred. Secretary general Lynch stated “that the issue of if and when any relevant person may be advised of their circumstances would require careful and expert consideration”, the released documents show. After another interim report towards the end of April, Lynch wrote to Quinlan on 2 May after the latter had suggested giving a presentation outlining all of this to Minister Zappone. In the letter he raises the idea of an “ethical issue” on whether to inform those who are affected. Lynch said: “As we discussed at previous meetings, it will be vital to deal with informing those affected both sensitively and comprehensively, in the sense of giving them what ever information is available about them (which I understand may vary a good deal from case to case). There remains the ethical issue of whether the information will do more harm than good to those who have no indication of the problem to date. Despite these concerns, THE decision was made to tell those affected by the time Zappone made the announcement on 29 May. A senior civil servant in the adoption policy unit of the department, Marie Kennedy, then emailed Siobhan Mugan on 9 May. Kennedy told her that Minister Zappone may want to go public with the information immediately after meeting with Tusla officials the following day 10 May. It wasn’t until almost three weeks later that the matter was made public. In that presentation to Zappone, it noted that only records that were flagged “adoption from birth” had been examined, as that indicated an incorrect registration. That meant “there could be other cases among the other 13,000″. As it got closer to the matter being made public, the department again emailed Siobhan Mugan on 11 May. It urgently asks Tusla to clearly set out any operational, procedural or legal difficulties it faces if a “decision is taken by government/the minister to inform those affected by an incorrect/illegal registration”. In response, Mugan sent back a number of “issues to consider”. These include “moral/ethical issue”, “who to tell first – birth parents, adoptive parents, subject of registration”, “how much information are they entitled to”, “how does the state manage litigation”. GDPR will have significant negative impact on the agency’s ability to carry out searches after 25 May. May not find every one. If the subject matter is deceased, do we advise their children? GDPR is the new Europe-wide regulation on data protection and privacy, which came into effect on 25 May. In an updated report on the status of the investigation from Tusla to the department on 14 May, it closes with a warning that there could be more incorrect registrations in the 13,000+ cases. Tusla said: “A full review of the full 13,500 cases had not been undertaken. Therefore, [with the rest in full caps on the memo] it cannot be said that there are not more incorrect birth registration amongst the other records. As it gets closer to the 29 May when the issue is made public. A great deal of correspondence occurred between Tusla and the department up to this date, with a number of press statement drafts shared, as well as how Tusla’s website would offer information to the public. There was some last-minute clarification on 28 May, when it was said by Marie Kennedy from the department that they would not use the term “illegal registration” as illegality had not yet been proven. Mugan replied that “I just want to be sure that we are all using the same one and it is legally correct”. Only a few hours after the announcement was made, a department civil servant emailed Tusla again to say that Minister Zappone’s office had received an email from a person who suspected he was one of the 126 cases. It was asked if the department should provide an email address or direct any queries to the helpline that had been set up by Tusla. Speaking in the Dáil last month, Zappone said the State will never be able to contact some of the people who were adopted and whose births were illegally registered in this country. Email “Adoption scandal: Officials questioned whether telling those affected would 'do more harm than good'”. Feedback on “Adoption scandal: Officials questioned whether telling those affected would 'do more harm than good'”.